I am loving how clear, simple, and expressive these visuals are. You can check out more from artist Ji Lee in his recently released book Word as Image. This recent chart from Fox News is an example of how an inaccurately designed chart can be horribly misleading. Take a look at the relative position of the 8.6% for the month of November on the far right. Charts should make trends in large sets of data more clear. Using them to mislead is wrong. Slide design narcissism: Logo on every slide. Stop putting your logo on every slide. Many companies think it's necessary to stamp a logo on every slide because it builds "brand image" and looks more professional. It doesn't. In fact, a logo on every slide hurts the effectiveness of your presentation. Here's why. 1. It's distracting. – Great slides support your message, they don't distract from it. Putting a big logo in the corner of every slide is wasting screen real estate with visual noise that doesn't enhance your message. 3. It hurts your brand. – An ineffective, boring presentation that's elaborately branded is worse for your brand than an engaging, memorable presentation with no branding at all. People remember presenters who can move them with a great story. Don't let bad slides get in the way of that. If you really want your logo in your presentation, keep it limited to the first and last slides. That way your audience can see what company you're from at the start and then are reminded of it again at the very end after you've wowed them with a memorable presentation. My friend and fellow blogger Harrison Brookie recently sent me this great TED talk by David McCandless. For those of us who love data visualization, it's a real treat. "There's something almost magical about visual information. It's effortless. It literally pours in. If you're navigating a dense information jungle, coming across a beautiful visualization is a relief. It's like coming across a clearing in the jungle." When I was a kid there were a lot of commercials for a board game called "Thin Ice". The game was simple — one by one you piled marbles (penguins) onto a wet piece of stretched tissue paper (iceberg) until eventually the paper ripped and all the marbles fell through. This game is exactly like the question and answer period after your presentations. When you ask for questions, nine times out of ten most people in your audience will just sit there, not saying anything, waiting for someone else to break the ice and ask the first question. It's a fact of audience psychology. People are shy. So why not break the ice yourself? Instead of ending your presentation with the usual "Q&A" slide, end with a slide that lists three to five example questions people might want to ask. Example questions make your audience feel more comfortable. You're breaking the ice for them, so nobody has to worry about going first. And if you make the example questions simple, you eliminate the common audience fear of asking a "dumb question". Pre-prepared questions also enable you to have pre-prepared answers ready, making your Q&A look more like a continuation of your main presentation, and making you look more like a rockstar. Pictures make presentations better. Here’s why. Imagine a big wooden ship sailing into a stormy harbor. The waves crash as the sailors work to secure the ship against the dock. The more ropes the sailors can cast, the more securely the ship will weather the storm. Think of the ideas in your presentation as ships docking in the stormy harbors of your audience’s minds. The more associations you can make with your ideas — the more ropes you can cast — the better they will be remembered. The metaphor isn’t too far off from the actual biology of memory making. The more relationships you can associate with an idea, the more neural connections are formed and the more rooted it becomes in your memory. Most mnemonic devices play on this, getting you to associate additional objects or sounds with the thing you’re trying to remember. Slides give you the opportunity to tap into parts of the brain words alone can’t reach — the picture parts. 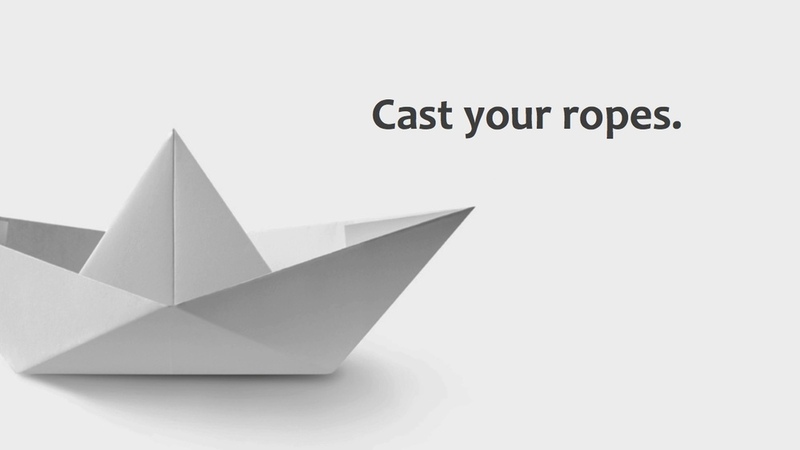 Think of the visuals in your presentation as additional ropes to cast. It’s one thing to talk about your idea, it’s a better thing to show it. You can see this idea in action in the example slides below. The slide on the left is a typical text-heavy presentation slide. It's the speaker's talking points in bulleted form. It contains everything the speaker is going to say, but doesn't do much to make it more memorable. You could easily take this slide out and the presentation would be no worse without it — in fact, it may even be marginally better. The slide on the right is the exact same content, but it uses a picture instead of words to relate the message. The speakers talking points have not changed, they're just now being spoken instead of read. 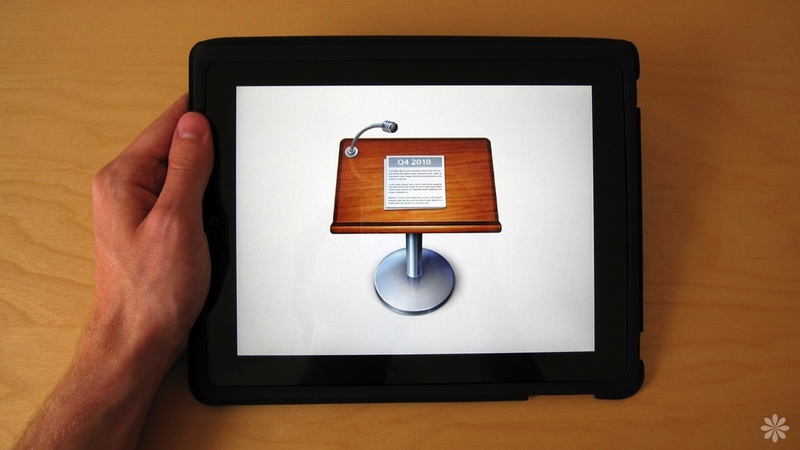 The audience has an extra trigger at their disposal, a visual cue, to make the content easier to remember. Which slide resonates more with you? It can feel risky to not include all of your content on a slide, to go with a visual instead, but your presentation is made stronger because of it. At the end of the day isn't that the point? Breaking up is great to do. Overloading a slide with too much information is an all too common presentation design faux pas. Bullet point after bullet point — one for each idea you want to express — clutters the slide and forces your audience to spend more time reading than listening. People often try to reduce the clutter with animations, building one bullet point on the screen at a time, but by the last build it’s still a bloated mess. Instead, break up your content and put each point on its own slide. It’ll give your messages some room to breathe, making it less likely for you to overload your audience with too much information. Your story will be easier to follow. 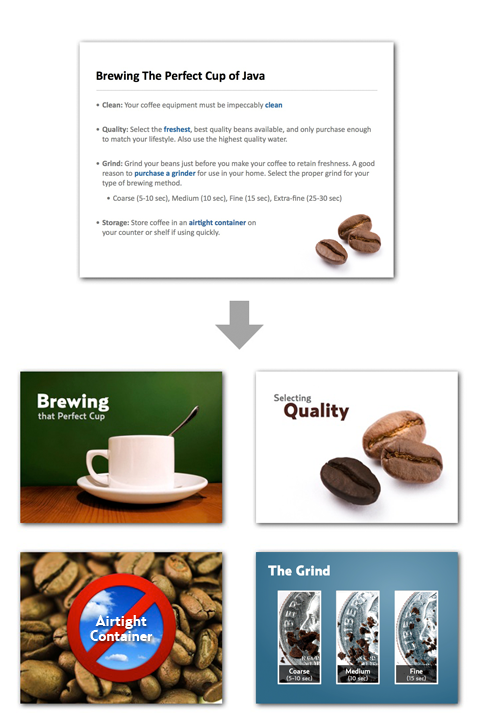 Splitting up your content helps you the designer see which points can be enhanced with an evocative visual. A picture, as they say, is worth a thousand bullets — so why not use one? Great slides help you tell your story. Bad slides distract your audience, or worse, force them to work harder to understand you. Avoid bloated slides. Break them up. It turns out there’s a scientific explanation for why we don’t remember much from a bad PowerPoint presentation. Scientists studying "cognitive load theory" at the University of New South Wales in Australia have published a report that has shaken up the way the world looks at presentations and learning. Their research suggests the human brain is good at reading, good at listening, but not very good at doing both simultaneously. Presenting someone with the same information verbally and visually (e.g. reading from a bad PowerPoint slide) makes absorbing the information much more difficult. Our brains can only take in and remember so much at once. He has a good point. Public speakers have been putting audiences to sleep with PowerPoint for years, but that doesn’t mean we should ditch the application all together. After all, it isn’t fair to blame the tool for the craftsman's mistakes. Effective presentations never make life harder on an audience. Professor Sweller offers good advice when he recommends we speak to diagrams instead of bullet points, but that’s only the tip of the iceberg. Keep the text on your slides to a minimum, phrases that only take a few seconds to read. Instead of bullet points, use diagrams and images as the backdrop to your story. When you’re presenting a longer quote, don’t be afraid to stand silently while the audience reads the quote for themselves. Ultimately, the key takeaway is this: Never force your audience to choose between listening to what you say or reading the text on your slides. You can’t expect them to do both, and you might not like what they choose. Have you ever opened a presentation someone sent you, only to find the text formatting too messed up to read? Chances are, the person who designed the presentation used a custom font you don't have. Custom fonts are a great way to make your slides more expressive, but they can cause serious problems when you try sending your presentation to someone else. Presentation applications (i.e. Keynote and PowerPoint) don't embed fonts into presentation documents. This means if you're making a presentation you plan to send to several people, it's best to use only universal fonts. In the example below, I designed a simple slide using the custom font Trixie. The version on the left shows what the slide looks like on my computer, a computer with the font installed. The version on the right is the exact same slide, but on my friend's computer, which does not have the font installed. Notice the difference? If you use a PC, you don't have much to worry about — almost all of the fonts that came installed on your computer are universal. If you use a Mac, you have to be a bit more careful. You have several great fonts on your machine that your PC brethren might lack. Using type effectively is an art and a great way to make your slides more expressive. For presentations you'll only deliver from your computer, feel free to go nuts using any fonts you want. But for presentations you plan to send to other people, remember to be careful with your font choices. Note: PowerPoint 2007 for the PC does, in fact, allow you to embed custom fonts into your presentation. First, click "Save" and then click the "Tools" button. Select "Save Options", and then click the "Embed fonts in the file" check box. If you're interested in learning more about custom fonts, the link below highlights a collection of 21 of the most used fonts by professional designers. It's definitely worth checking out if you want to experiment with using a font other than Arial or Calibri in your next presentation. They say a photo is worth a thousand words, and a good chart is worth a million numbers. There's no denying the fact our brains are wired to understand visuals better and faster than numbers. I ran across this super-creative visualization online last week and was blown away. The chart depicts US movie box office numbers for every opening weekend in 2008 (it's still being updated over time). This is a brilliant visualization because it does exactly what a great chart should do — it conveys an enormous amount of information, all of the relationships within a huge set of data, instantly. Nothing about this chart is creative just for creativity's sake. All of its features, from the colors to the shapes, make it more effective at telling its story. Makes an ordinary bar chart seem kind of dull, doesn't it? Slide backgrounds: Light or dark? Which are better, light or dark slide backgrounds? Surprisingly, designers are engaged in a heated debate over this question; each side claiming one style is easier to read than the other. The difference in readability matters for texty mediums such as magazines and websites, but is comparatively irrelevant for your slides, as they only contain a few words each. So, should you make your backgrounds light or dark? The answer depends on the context of your presentation and the tool you use to display it. In this entry, I offer some tips to help you decide which style will be most effective for your next presentation. Ever wonder why it’s always dark in a movie theater? Projectors can’t make the color black. A black pixel from a projector is really just a small shadow. Projected images always look better with the lights off because any ambient light in the room fills in those shadows, reducing the contrast ratio between the light and dark pixels and making the dark colors in your slides look dull. While we usually think of projectors when we think about presentations, people actually use a variety of tools to display their slideshows. Many modern boardrooms have replaced projectors with large, wall-mounted televisions. Traveling sales reps often present to clients from their laptop screens. I’ve even worked with clients who print their slides on heavy card-stock and flip through the cards manually as they deliver their speeches. Dark slide backgrounds look best on electronic displays (e.g. computer screens, televisions, etc). If you’re using a dark background on a projector, you'll need to make sure the room has good presentation lighting. That doesn’t mean turning all the lights off — nothing encourages nap time more than a meeting in the dark. Good presentation lighting just means there's darkened area for the projector screen. Dark slide backgrounds are also a strategic choice for long presentations, such as all-day seminars or workshops. When slides are too bright, I’ve heard audiences at these events complain they feel as though they’ve been staring at a lightbulb all day. Light slide backgrounds are just the opposite. First off, they’re much more versatile. Since light backgrounds are brighter, they look good coming from just about any quality display or projector, in any kind of room lighting. Additionally, they’re ideal for printed presentations since they tend to use a lot less ink. Solid-white backgrounds make it super easy to add beautiful, dynamic images to your slides. A huge percentage of stock photos portray an object floating over a white background (these are called “isolated images”). A white slide background enables you to seamlessly incorporate these images into your presentation without wasting time in Photoshop cropping out the image backgrounds. Ultimately there are no steadfast rules for which style to use, just a few flexible guidelines to help you make the best choice for your next presentation. Experiment with different styles, and as always, be creative with it. Stock Photos: Where to get them? It's no secret beautiful pictures can improve the impact of your slides, but a lot of people don’t know where to find them. Clip Art looks like it still belongs in the early-1990s, and Google’s Image Search rarely yields the high quality images we're looking for. Not to mention, there are legal issues with reusing copyrighted images found in the random tubes of the internet. If you’ve never heard the term, “Stock Photography” refers to photos that are not taken for a specific client, but instead are made available for use by any client for any purpose. “Royalty Free”, a phrase you’ll often hear around stock photos, just means the image can be used an unlimited amount of times in certain media without paying royalties to the photographer. Historically, stock photo catalogs were only available to professional media and design firms. The images were priced out of reach of ordinary people. Fortunately, the internet has leveled this playing field and in the past few years several stock photo resources have sprouted up aimed at both professionals and consumers alike. stock.xchng - (Free - Mixed Quality) When budget is an issue but you want good quality images, this is the place to go. Stock.xchng is, by far, the best free stock photo resource I know of. Their image tagging could be better, but on the whole their search tool works very well. Not all the images in their library are spectacular, but there are enough gems mixed in to make searching around worthwhile. There is also a for-pay sister version of the site (stock.xpert), which boasts higher quality photos (as well as illustrations) for very reasonable prices (about $1-$10 per image). iStockphoto - (Inexpensive - High Quality) Out of all the stock photo resources on the web, this one is my favorite. 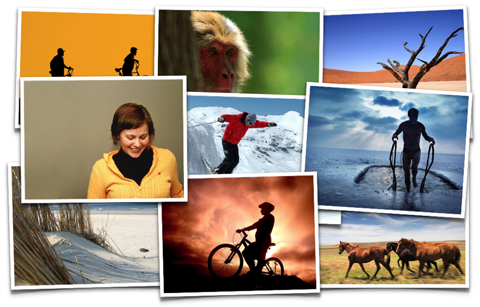 iStockphoto has a gigantic library of photos to choose from (their library also includes illustrations and videos). The site enforces strict guidelines for the quality of images that can be submitted, so most of images come from professional photographers and designers. The entire library is very well tagged, so when you perform a search you almost always get the results you want on the first try. While the images aren’t free, they are very reasonably priced (about $1-$10 per picture). It’s a small price to pay for the impact and professionalism such high quality images will add to your presentation. Definitely check this one out. Getty Images - (Expensive, Best Quality) Getty is the top dog when it comes to stock photography. It may be expensive, but when you have the budget or just need that one perfect picture, there’s no better place to go. Getty is the image resource for countless top-notch media and design firms around the world. Of course, there are many more stock photo resources out there. These are just a few of my favorites that you may also find useful when making your next presentation. If you have a favorite photo resource I did not mention, go ahead and leave a note about it in the comments. Let’s shift gears now and talk about design. Well-designed slides alone don’t make a presentation great, but they certainly don’t hurt either. Design is a tricky topic to address because people tend to see design as a profession, something only “designers” do. In the same way that too many people think they can't be creative, too many people think they can't design things. When we’re little kids we spend hours and hours painting pictures. We are born as little designers. We draw the things we see, the things we think about. We don’t worry about critics or cynics. We don’t care what others might think if we express ourselves, if we show our feelings. As little kids the world is full of new things. We notice a lot of little nuances, so many we can’t help but express the world we see. Yet somehow this creative drive gets sucked out of us as we grow up. We get used to the things in the world and start to feel self-conscious about expressing ourselves. We forget we were once little designers. We forget what we can do. The first step to good design is good observation. Slowing down just a little bit, paying attention to the world and noticing the nuances that make things interesting is the best design education you can get. Design is all over the place. You can set two photos of the same object side by side and see two very different images. Next time you see a photo you like, pause a moment and ask yourself why you like it. The “Rule of Thirds” has to do with framing your shot, which is to say it has to do with where you line up the things in your photo. Imagine drawing two vertical and two horizontal lines across your image, dividing it into thirds each way (like a grid with nine boxes). The idea is to line up the important elements of your photo (the horizon, the person’s eyes, etc) with these lines and their intersections, instead of lining them up with the exact center of the image as we’re inclined to do. It isn’t exactly clear why (it has to do with the Golden Ratio), but images lined up on the thirds tend to look much more natural and appealing. Something about them is more interesting. Once you know about the Rule of Thirds you’ll see it being used all over the place. Magazines and other print media regularly use it for their layouts. Cinematographers line up movie scenes along the thirds all the time. Television directors do the same thing (notice where the news anchor sits and where the graphic lines up in the upper corner). The Rule of Thirds can make your PowerPoint slides look a lot better too. Our first impulse is usually to place objects on the horizontal and vertical centers of our slide. Instead, next time you're making a presentation try aligning your text boxes and images on the thirds. It will often lead to a less typical and more interesting looking slide that's more appealing to an audience. Using grid lines of any kind in your slide design also adds a consistency to your slides that makes the whole presentation look more polished and professional. The Rule of Thirds is one of those great design tips that comes from nature, so it can be picked up intuitively. It resonates well with human perception and can make your slides look a lot more appealing. It’s a design tip that’s simple to implement and yields big results, so give it a try in your next presentation.